The Federal Government has barred banks in the country from giving loans to state governments. The decision was taken in line with the Fiscal Sustainability Plan, FSP, which has been agreed to by the Federal Government’s economic team and state governors, to ensure prudent management of sub-national resources. This comes as the Central Bank of Nigeria, CBN, will today announce details of the much anticipated ‘flexible’ foreign exchange rate policy. 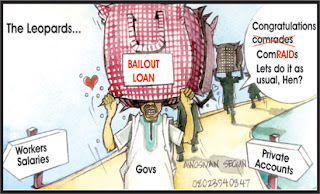 President Muhammadu Buhari’s administration, Finance Ministry sources said, was disappointed at the manner some past and current governors took loans from banks and misapplied such funds, while mortgaging their states’ finances. Currently, some states are left with too little to meet even their recurrent obligations, after deductions are made from their monthly federation account allocations. Rather than bank loans, the Federal Government asked states to source funds from the capital market for their infrastructure development. It also insisted that funds sourced through bonds must not only be on bankable, measurable projects but must also be released in tranches. It was gathered that the release of the proceeds of bond issuing will, henceforth, be on the basis of satisfactory utilization of earlier released proceeds. The FSP aims to improve accountability and transparency; increase public revenue; rationalise public expenditure; improve public financial management; and sustainable debt management. Specific action points of the reform include biometric capture of all civil servants; establishment of an efficiency unit in each state, implementation of continuous audit, improvement in internally generated revenue, IGR, and measures to achieve sustainable debt management. States that meet the above FSP conditions can access a new N50 billion facility to be guaranteed by the Federal Government.